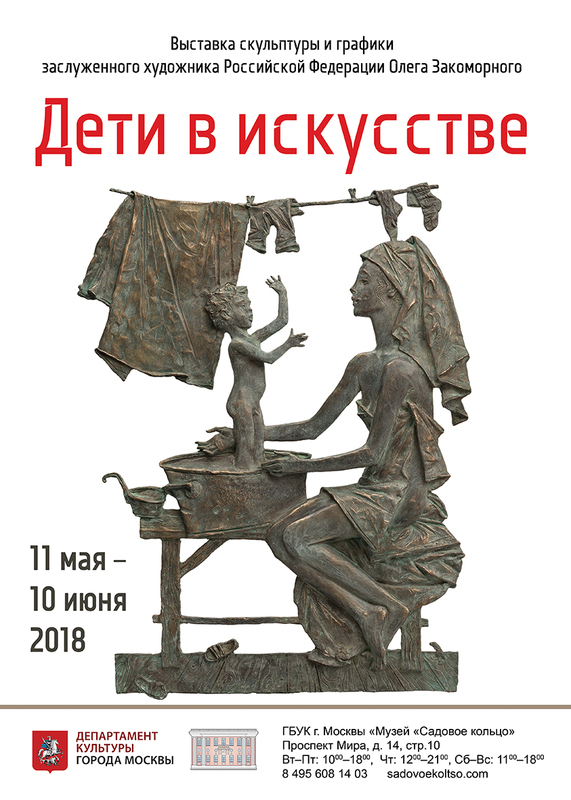 The museum “Sadovoe Kol’tso” holds the exhibition of Oleg Zakomorny’s sculpture and paintings “Children in art”. On view are the best works of the artist devoted to children and childhood in general. Organizers of this exhibition have tried to recreate the world in which the parent love, mischievous children and gentle connection of mother and the child rule. Two halls of the museum will be devoted to the theme of the childhood. Here will be presented images of children, their leisure, their lives, relations with adults, indissoluble connection with the senior generation and fauna. The next hall will transfer us to the touching world of the childhood of animals. This theme engrosses artist’s mind since a young age, exactly in this theme he reveals as a very gentle and attentive creator. Here, during “Nights of museums” the meeting with Oleg Zakomorny will take place. He will lead unique tour of his exhibition, and then will tell visitors about his works, and also will share creative secrets and plans.